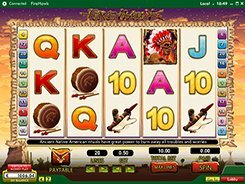 Fire Hawk is a Native American themed slot with 5 reels and 20 paylines. The symbols incorporate classic playing cards (from 9 all the way up to Ace), a smoking pipe, a drum, a dreamcatcher, an Indian woman and other themed icons. There are two customizable betting options in Fire Hawk: the number of paylines to bet on (up to 20), and a coin size ($0.05 to $10). By increasing or lowering these values, you may place a stake anywhere between $0.05 and $200 per spin. The Chief is as a wild that lands on reels 2 and 4 only and replaces other regular symbols. The slot offers a free spins feature that is activated by three or more Fire Hawk symbols. You are awarded 20 free spins, during which the wild symbol acts as a wild multiplier when used as a substitute in winning combos. Every time a wild substitutes on reels 2 OR 4 in free spins, all payouts are multiplied by two or five accordingly. If a wild is involved with any winning line and lands on reels 2 AND 4 in free spins, the winnings will be multiplied by ten. PLAY FOR REAL MONEY!